We asked Passmark, a third-party software testing specialist, to test the performance of our cleaning and defragging tools: CCleaner and Defraggler. 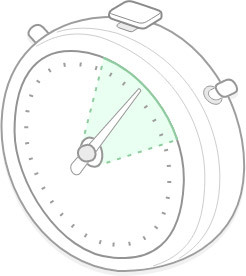 Automatically cleaned and defragged endpoints means your IT department spends less time on basic maintenance and end users work on better performing machines, without the constant threat of low disk space. CCleaner recovers nearly 4GB of disk space on its initial clean and over the course of a year, will free up almost 34GB of disk space (based on weekly automated cleaning). 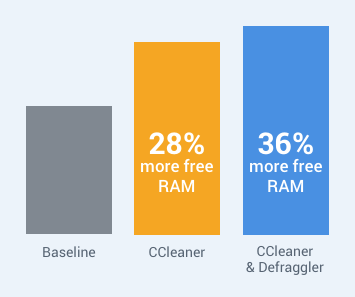 On average, using CCleaner can give you 28% more free RAM. When Defraggler is subsequently run, this increases to 36% more free RAM. Using CCleaner and Defraggler can make PCs boot 59% faster. Cleaning using CCleaner is 20 times faster than an experienced engineer performing the same clean manually.